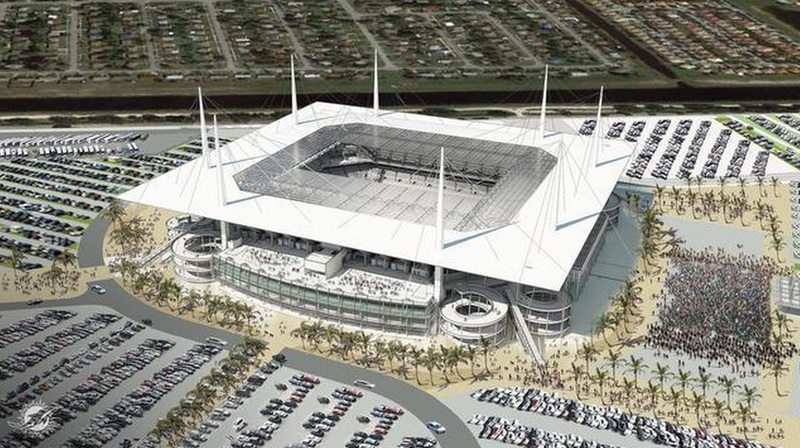 MIAMI- The Miami Dolphins won a deal Tuesday (June 17th) from Miami-Dade County that will have the team renovate its stadium, including adding a partial roof, in exchange for county payments when the team brings big events to the Miami Gardens facility. By a 7-4 vote, county commissioners approved their second stadium deal in two weeks, after endorsing an extended subsidy package for the Miami Heat earlier this month. The Dolphins’ plan would earn the team $4 million during a year when Sun Life Stadium hosts the Super Bowl, $3 million for hosting a college football championship and as little as $750,000 for international soccer matches and other special sports events. The money for the 20-year deal would come from hotel taxes. Team CEO Tom Garfinkel said after the vote that early work on the renovation of the stadium, which opened in 1987, would start by July, with major work taking place during football’s off-season in 2015 and 2016. “Having a modernized facility means the Dolphins can play here for many years to come,” Garfinkel said. 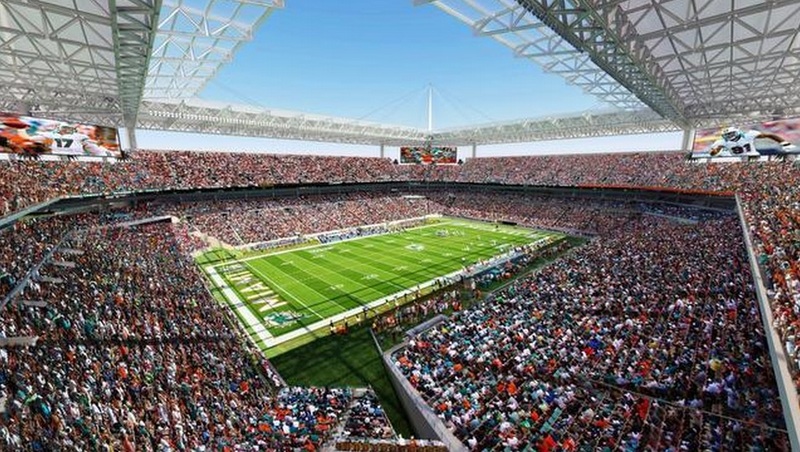 The victory of the stadium plan caps five years in which Dolphins owner Stephen Ross tried to get funding for a stadium upgrade. In previous years he had asked Broward County to provide money for the renovation, proposed raising hotel taxes in Miami-Dade and, most recently, asked Miami-Dade to waive the team’s $4 million property-tax bill to compensate for construction costs. County Mayor Carlos Gimenez negotiated the latest deal, and called it good for tourism and similar to incentives offered to companies to expand hiring in Miami-Dade. Ross, a New York real estate developer with an estimated net worth of $5.5 billion, did not attend Tuesday’s commission meeting. Former Dolphins greats Dan Marino and Jason Taylor sat in the audience with front-office executives and lobbyists, but did not address commissioners. With hotel-tax revenue already strained, Gimenez negotiated a 10-year delay on payments to the Dolphins. While the team will earn credit for events held before 2025, Miami-Dade can hold off writing a check to the Dolphins until then. The obligations will not earn interest. The deal allows Miami-Dade to suspend payments if hotel taxes do not generate enough revenue to fund the current budget and the new Dolphins obligations. A World Cup final game would be worth the same as a Super Bowl: $4 million. A World Cup semi-final would bring the Dolphins $3 million, the same as a college championship. College playoff games, set to come to Sun Life every three years under the new Bowl Championship Series system, bring $2 million, and smaller sports events like international soccer matches would qualify for $750,000 if the games are sold out. Rolando Aedo, head of marketing for Miami-Dade’s tourism bureau, told commissioners he thought Wrestlemania, which brought record attendance to Sun Life in 2012, should qualify for the $750,000 category. The deal also calls for the Dolphins to sign a 30-year non-relocation agreement with Miami-Dade. While the team agreed to stay 30 years, the subsidy program expires 20 years after it starts. The program is likely to start in 2016, provided the National Football League awards the Dolphins the 2019 Super Bowl next spring. If not, the program would not begin until Sun Life is awarded a Super Bowl or a World Cup soccer match. The Dolphins would not earn credit for eligible events until after they take place. Ross is pursuing a $3 million annual state subsidy for the renovation, and plans to tap into NFL construction funds that are reserved for franchises that secure government assistance for stadium deals. 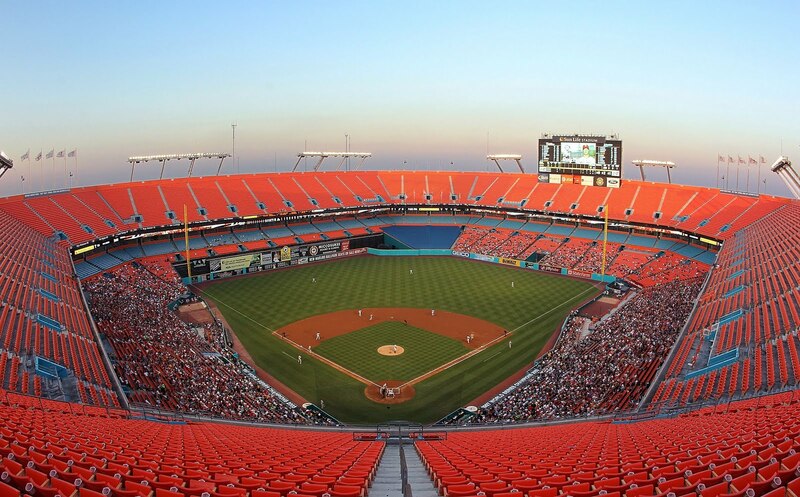 Unlike the Heat and the Miami Marlins, the Dolphins own their stadium and pay about $4 million yearly in property taxes to Miami-Dade. The renovation would add more seats closer to the field while removing upper-level seats, bringing the stadium’s current capacity of about 76,000 down to 65,000, Garfinkel said. Team executives also said the redo would make the facility more friendly to soccer matches. Ross had once hoped David Beckham would bring Major League Soccer to Sun Life, but Beckham is pursuing a new stadium in Miami with about one-third of the seats that Sun Life has. Garfinkel said Tuesday the renovation plans have changed slightly since they were revealed during last year’s subsidy push, but he declined to elaborate. 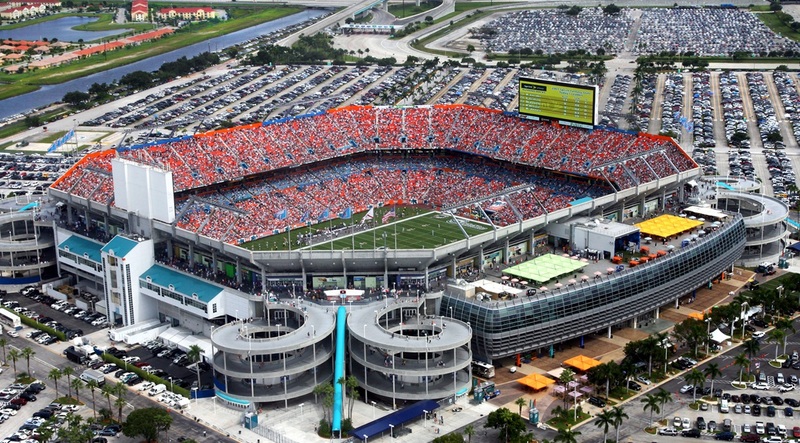 Miami’s Sun Life Stadium opened on August 16, 1987 as the most modern NFL stadium at that time. 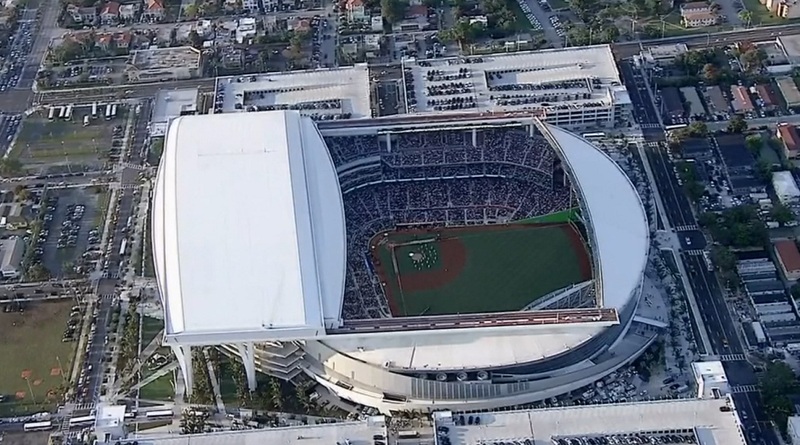 It served as home to Major League Baseball’s Florida Marlins from 1993–2011. Since 2008 it has also been the home of the University of Miami Hurricanes. The stadium has had many names over its lifetime of us. Originally the stadium was named Joe Robbie Stadium. The name of the stadium was later changed to Pro Player Park, Pro Player Stadium, Dolphins Stadium, and Land Shark Stadium. 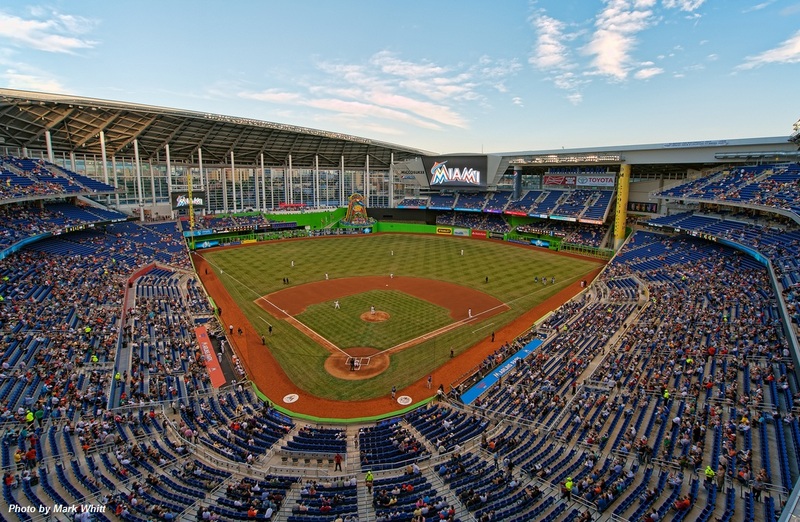 Marlins Park opened on March 5, 2012 leaving Sun Life Stadium as a football only stadium.